For courses in Classical Mythology in Classics, English, or other departments. 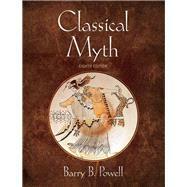 Comprehensive and scholarly, this well-designed and class-tested text presents Greek and Roman myths in a lively and easy-to-read manner. It features fresh translations, numerous illustrations (ancient and modern) of classical myths and legends, and commentary that emphasizes the anthropological, historical, religious, sociological, and economic contexts in which the myths were told. It also provides a cultural context so that students can see how mythology has influenced the world and how it continues to influence society today.